Friday is here, which means that it is time for the second Community News update this week. Today you can find plenty of fansite updates as well as cool WoW comics, and don’t forget to check out the latest handful of interesting and cool threads that were posted on our forums during these last few days. 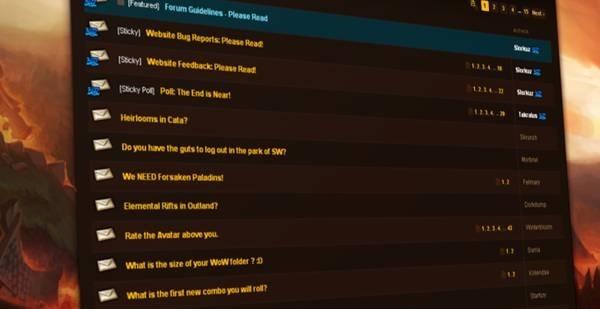 Swedish site LevelCap.Se has asked its readers for their fondest memory from vanilla WoW. Finnish fan site Goblin Explosives Network has taken a look at how people of various ages balance WoW with real life. Greek site World of Warcraft Hellenic Community reminds players of its 2nd panhellic meeting in Athens. Hungarian site World of Warcraft Hungary examines WoW’s interface, pointing out some of the useful tools such as the alarm clock. Italian site Battlecraft has updated its talent builder for patch 4.0.3a, allowing players to copy their planned builds directly into the game. Romanian site WoW Box Romania has posted a compact PvE Affliction Warlock guide which includes suggested specs, gear and enchants. Turkish site WoW-TR has compiled some favourite WoW proverbs. Blood and Thunder: On the emergence of Deathwing. Drop by the Female Dwarves appreciation thread for a giggle. What has been your Favourite Quest in 4.0.3a so far? Compare your mods and interface setup in the Addon Thread. Check out this ever-useful guide on How to reach a fruitful discussion. The Fishing daily - what did your bag contain? Discuss your professions and the reasons for choosing them. New to WoW? Why not read this Newbies Guide to the game. How does one successfully form a guild?